Welcome to our Ischia blog, Good Morning Ischia! Here you can see the entry for Thursday 28th November 2013. We wake up this morning to the sight of grey, cloudy skies and it's a rather damp and soggy start to the day. The conditions outside are somewhat at odds with the majority of weather forecasts that are telling me it's sunny outside and it does make you wonder where they get their information from sometimes! Anyway, if we do still have any trust in said forecasts, they are "reliably" informing us that we should be in for a fairly sunny day with just a few clouds around. Let's hope they prove to be correct and that their predicted temperatures reach the maximum of 12° celcius (54° fahrenheit) this afternoon with a minimum of about 10° celcius (49° fahrenheit) for this evening. Today's photo is of one of Ischia's favourite and most stunning locations, Maronti Beach. Measuring around 3 kilometres in length from one end to the other, Maronti is the largest beach on the island and characterized by the brilliant azure colour of its water and the fine golden sand that lines the shore. Understandably it draws visitors from far and wide who seek the warm relaxation of sunbathing coupled with the magnificent views out to sea, including some of Ischia's neighbouring islands in the distance such as Capri. The beach is accessible from several directions, each of which provides its own unique and scenic approach. The most popular route to Maronti is by road with several large car parks behind the beach meaning there's plenty of space, even during the busiest months of summer. From the main SS270 road that circles the island you take the turn off for Testaccio and hold your breath as you witness the beautiful vistas that greet you on the road that winds its way down to the beach. There are several viewing areas ("belvedere" in Italian) where people stop to take photos and that is precisely where this particular photo was taken. For those people that like walking there are a few different routes to choose from and they all have their own charms. The easiest walking route to Maronti is from Sant'Angelo, an undulating path that is steep in places, takes you across the rugged terrain and over some cliff tops with some stunning panoramas on offer. The walk from Sant'Angelo takes about half an hour for someone of average fitness and when you arrive at the beach there are no shortage of choices to replenish your energy levels with dozens of restaurants and cafes waiting to refresh you. Possibly the most relaxing way to reach Maronti is by water taxi. From the aforementioned Sant'Angelo you can hop on a boat from the main square for just €3 per person as it takes you round the promontory to drop you off at the beach. The same water taxis also offer services to other popular locations nearby such as Cava Grado beach and Sorgeto Hot Springs. You could even take a combination of routes to and from the beach, depending on which mood you're in, you could say walk there and then take a water taxi back to Sant'Angelo or even vice-versa, such are the difficult decisions you have to take when you're on holiday! 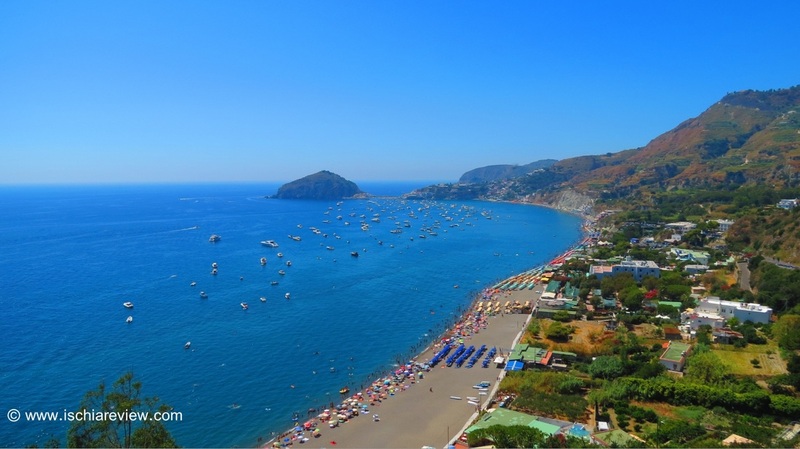 For more information about Maronti or any of the other beaches in Ischia, just drop us a line or navigate your way around the site using the links and menus provided. That's all for this morning, have a great day wherever you are and we hope to see you soon in this little corner of paradise.